CAMEO (Come And Meet Each Other) is for all ladies (and gentlemen!) 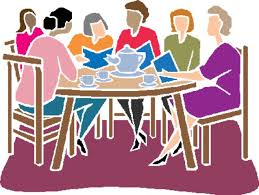 who like to meet regularly to share worship, fellowship and a cup of tea in a relaxed and friendly atmosphere. It was started in the early 1970’s when there was no women’s group at St. Laurence’s. During the first 25 years it was led by the wife of the Rector and was held firstly in different member’s houses. Later, as it grew, the Parish Centre became its permanent venue. About 20 years ago it had become so popular that it was felt necessary to put it on a more structured footing and a committee was formed still led by the wife of the Rector. Nowadays one of the committee members leads the meetings, which are held on the first Wednesday of the month with the exception of August. The afternoon begins at 2.30pm. with a time of praise and prayer followed by a speaker who may be a member of the clergy, a representative of a local or Christian charity or someone with an amusing and interesting story to tell. The afternoon ends, of course, with a cup of tea and a chat with old friends or new acquaintances. During the year we also have a lunch party, a tea party and an outing to a local place of interest. Transport is provided for any who find it difficult to walk to or from the Parish Centre. We have a membership of approximately 80 with a monthly attendance of about 40. Do come and join us. Whether or not you attend St. Laurence’s church or whether you attend any other church in the town, you will always be welcome.